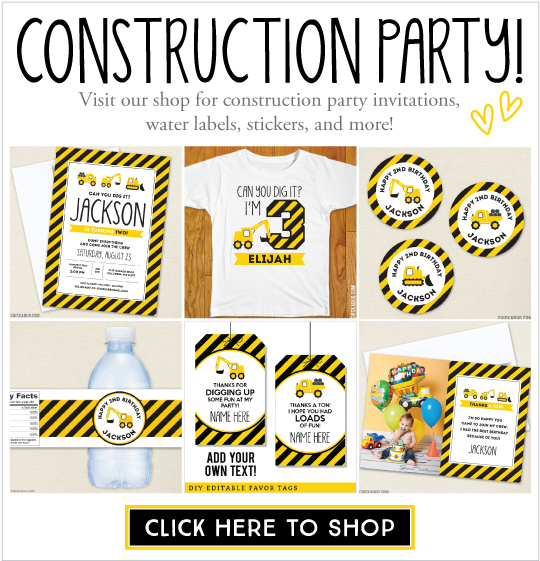 Construction party ideas: Food, decor, games and favors! Great collection of ideas!! Wish I had this when I was planning Ethan's party. Thanks for featuring the wrecking ball crane! It was a BLAST to use. You've included everything for a super successful construction party! Thanks for featuring my tutorial on how to build a cardboard bulldozer - it was a huge hit with the little ones. What size circle labels did you use? Love the ideas! Awesome collection! Thanks so much for sharing this. I'm pinning now so I can get started party planning. Love it! hi! Thanks for posting!! I looked for the tool set on the site linked.., could not find it at all :(. Did you buy it from there recently? Looks like it's not available any more, but there are similar products on Amazon. I'll update the link! Such an fantastic blog you have! Thanks for including me in it! Such great ideas for construction parties. Great stuff Heather! I really doubt if those (children) who participated don't ask funny questions whenever they see construction going on a road-side. Construction themed birthday party help to make little construction lover birthday memorable. I really like it. Thanks for sharing this post.